Six months after Australian Carrier Qantas was forced to amend its website details, removing any reference to Taiwan being a separate country to China, American carriers are now in the crosshairs of the Chinese government as it looks to enforce its One China Policy. While territories such as Macau and Hong Kong are accepted as being part of mainland China after leases to the U.K and Portugal ended in 1997 and 1999 respectively, Taiwan has always been seen as a separate entity, an independently governed state since the formation of the communist regime 70 years ago. The Chinese government continually refuses to accept that Taiwan, (often referred to as the Republic of China ROC), is independent of the People’s Republic of China (PRC) and is now towing a hard line on those who choose not to follow suit. With tensions rising over a trade dispute between the U.S and China, the Chinese government has refused to hold talks requested by the U.S. on the matter and has bluntly asked the U.S. to advise its airlines to amend their websites in order to show that Taiwan is part of the PRC. Speaking at a daily news briefing, Chinese Foreign Ministry spokesman Lu Kang said it was the broad consensus in the international community that there was only one China and that Taiwan was part of it, and that this was not up for negotiation. Foreign companies operating in China must respect the country's sovereignty and territorial integrity as well as the feelings of the Chinese people, he added. "I again stress, the 'one China' principle is the political basis of Sino-U.S. ties, and brooks no negotiations or consultations," Lu said. "The U.S. government should urge the relevant companies to scrupulously abide by the one China principle and rectify their websites as soon as possible." The closing of the previously announced C Series transaction between Airbus SAS, a wholly-owned subsidiary of Airbus SE, Bombardier and Investissement Québec came into effect on July 1, 2018. Airbus now owns a 50.01% majority stake in C Series Aircraft Limited Partnership (CSALP), while Bombardier and Investissement Québec (acting as mandatory for the government of Québec) own approximately 34% and 16% respectively. CSALP’s head office, primary assembly line and related functions are based in Mirabel, Québec. Furthermore, as previously announced, on July 1, Bombardier has issued in the name of Airbus SAS warrants exercisable for a total number of 100,000,000 Class B shares (subordinate voting) in the capital of Bombardier, exercisable for a period of five years at an exercise price per share equal to US$1.74, being the U.S. dollar equivalent of CAD$2.29 on June 29, 2018. Airbus' brand new A330neo has landed in Mauritius for the first time on June 30, as part of the final phase of test flights leading to the Type Certification of its latest mid-size widebody airliner. The aircraft, an A330-900 painted in the livery of launch operator TAP Air Portugal, had arrived at Sir-Seewoosagur-Ramgoolam International Airport (MRU) after a flight from Kuala Lumpur (Malaysia). The stopover was part of the ”route proving” campaign taking place around the world designed to demonstrate to aviation authorities its compatibility with airports and readiness for airline operations. This trip marks the A330neo’s first time in Africa. Jet Airways, India's premier international airline, has inducted its very first Boeing 737 MAX in its fleet. The 737 MAX represents Boeing’s latest upgrade to its single aisle 737, which has been the backbone of Jet Airways’ fleet ever since the airline commenced operations in 1994 with the then latest 737-300s. The new 737 MAX 8 will offer a standard two-class configuration comprising 12Premiere and 162 seats in Economy, complete with JetScreen - the airline’s in-flight entertainment system that offers over 330 hours of the latest entertainment on personal devices. Guests can relax and enjoy their favourite programming from among Hollywood, Bollywood and regional movies, TV shows, games and music. 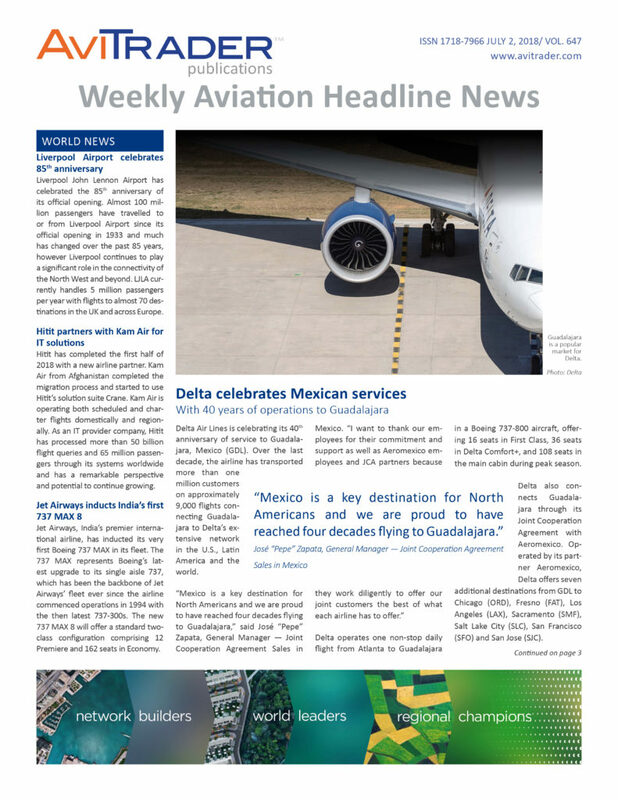 DAE Capital has taken delivery of its first new Boeing 737 MAX 8 aircraft on lease to Gol Linhas Aéreas, Brazil’s largest airline by passengers carried. The delivery took place at the Boeing delivery center in Renton, USA. In addition to being the first MAX aircraft to enter the DAE fleet, this delivery marks the first MAX aircraft to deliver to GOL and the first MAX aircraft to enter the fleet in Brazil. The transaction is part of a five-aircraft purchase-leaseback transaction with GOL. TRUEAERO Asset Management (TAAM) has completed its first Boeing 777 C-Check. The aircraft, a Rolls-Royce Trent 800-powered 777-200ER, underwent the major inspection event, which was completed over 45 days between February and March, as part of a transition to a new lessee. TAAM provided contractual oversight services on behalf of the aircraft’s owner, with deployment of a four-person supervisory team on-site at Pulsar Aviation Services at its San Bernardino (California) International Airport facility. The 777-200ER project was TAAM’s first C-check on a wide-bodied airframe after years of experience overseeing major maintenance on narrow-bodied transports. TAAM, a business unit of TRUEAERO LLC, focuses on investments in mid to end-of-life aircraft, as well as undervalued aircraft and parts which benefit over time from market volatility, throughout North America, South America, Europe and Asia. At TAAM, management takes an active approach to investing, seeking opportunities where significant value can be unlocked through capital restructuring, operational improvements, and strategic asset management. Founded in 2014, TRUEAERO is a leading commercial aircraft and turbine engine sales, leasing, aftermarket parts and materials management company. Headquartered in Sebastian, Florida, the company has facilities in Dallas, Singapore, and Dublin.